The hormone HCG, which stands for human chorionic gonadotropin, helps to communicate to your body that you're pregnant and maintains the pregnancy during its early weeks and months. 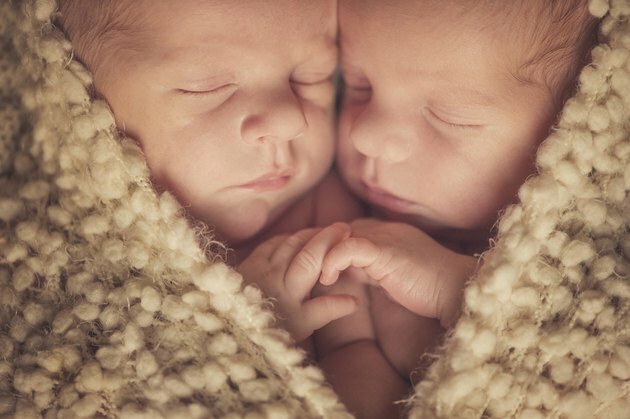 Because developing embryos produce HCG, levels of HCG in a woman's body are particularly high when she's carrying twins or higher order multiples. Each month when you ovulate, tissue in the ovary called the corpus luteum secretes large quantities of estrogen and progesterone. These hormones work together to thicken the lining of the uterus, in case you conceive a child. In the event that you don't conceive, the corpus luteum degenerates after about two weeks, decreasing hormone levels and leading to uterine sloughing, or your menstrual period. If you do conceive, it's the job of HCG--a hormone produced by a developing embryo--to communicate to the corpus luteum that you're pregnant. This maintains the corpus luteum, and it keeps secreting hormones. As a result, you maintain your uterine lining, which gives the developing embryo a place to implant. The uterine lining also provides the embryo with oxygen and nutrients until the placenta forms. Your body doesn't produce HCG--it comes purely from your developing baby. As such, if you've become pregnant with twins, each developing child secretes a normal amount of HCG, resulting in particularly high levels compared to those observed in a single pregnancy. While HCG levels can vary drastically between individuals, they're typically much higher in twin pregnancies than single pregnancies. With twins, as with single pregnancies, HCG levels normally increase significantly through the first three months of pregnancy. Typically, HCG doubles every 48 to 72 hours. Home pregnancy tests check for the presence of HCG in your urine. Because HCG levels rise dramatically in early pregnancy, and because mothers of twins typically have higher blood and urine HCG than mothers of single babies, you're likely to get a positive pregnancy test a little sooner if you're pregnant with twins. One downside to the high concentrations of HCG typically found in women pregnant with twins is that they'll often experience more HCG-related symptoms than women who have single babies. For example, HCG levels appear to contribute to the morning sickness common in early pregnancy. If you're pregnant with twins, you may have earlier or increased morning sickness symptoms due to your high HCG. What Are the Main Functions of the Female Reproductive System? How Do I Increase HCG Levels Naturally? When Does hCG Appear in Urine? Is Leaking Breast Milk an Early Sign of Pregnancy?